On Friday, June 3, Waubonsee Community College celebrated the grand opening of its new downtown Aurora Campus at an event that drew more than 1,000 people. In addition to building tours, attendees heard remarks from Aurora Mayor Thomas Weisner and several Waubonsee officials highlighting how students can now access a complete education all in Aurora. "Waubonsee has a long history of providing access to education and training for all members of the Aurora community in the heart of downtown, and I am excited about the new opportunities this expanded, state-of-the-art facility will provide for our students, employers, and community members," said Waubonsee President Dr. Christine Sobek. 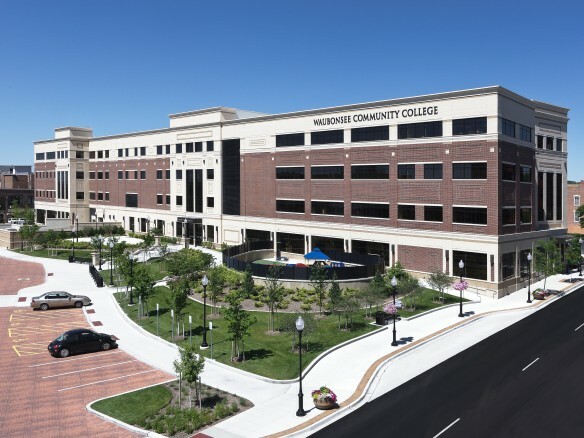 Located on the west bank of the Fox River at 18 S. River St., the 132,000-square-foot campus is comprehensive, meaning that students can start and finish an associate degree entirely at the campus. The transfer-oriented Associate in Arts and Associate in Science Degrees will be offered, along with full career-oriented degrees and certificates in such high-demand fields as health care interpreting, health information technology, sign language interpreting and certified nurse assistant (CNA). Students can also take developmental education and community education classes at the campus, or choose to enroll in the workforce development and adult education programs. "This new campus will serve students with all types of educational, training and personal development goals, all in Aurora," said Dr. Deborah Lovingood, Waubonsee’s Executive Vice President of Educational Affairs/Chief Learning Officer. No matter what courses they take, students will learn in a state-of-the-art educational environment with 52 classrooms, including two science labs, eight computer classrooms and other specialized instructional spaces. Other highlights of the $50 million project include a library, bookstore and an upper River Walk. A full complement of student services are also being offered at the site, including Admissions, Bursar Office, Counseling, Financial Aid and Registration. These offices are now open, with the building’s first classes set to begin on Monday, June 6. The former 88,000-square-foot Aurora Campus, which opened in 1986 and was housed in two historic buildings on Stolp Island, permanently closed its doors last week. It is currently for sale, and more information can be found at 5eastgalena.com. The new Aurora Campus is part of Waubonsee’s 2020 College Master Plan. This plan provides the roadmap for Waubonsee to meet the area's growing demand for education. In addition to this campus, other projects have included the construction of four new buildings at the Sugar Grove Campus and the construction of a new campus in Plano that opened this past spring. Cordogan, Clark & Associates designed the new Aurora Campus, JJR is the project’s landscape architect, and Turner Construction provided construction management. Read about it on the Waubonsee website here.